Legend states that the pandas were once all white bears. A young girl was killed while trying to save a panda cub from a leopard and supposedly the Pandas arrived to her funeral wearing an armband of black ash. As they hugged each other and wiped their tears and covered their ears the black ash smudged. Read on some interesting facts about panda including answers to some questions like are pandas bears. During the Han dynasty in China (206 BC – 24 AD), Pandas were believed to possess mystical powers and hence were highly prized and were a part of the emperor’s gardens. Pandas are considered as the national treasure in China. Jiajia is the oldest recorded Panda (in captive) in the world. She brought in her 37th birthday in 2015 (110 years old in human years) in Hong Kong’s Ocean park, with a birthday cake made of fruity ice from the Guinness World Records. Scientist Gordon Buchanan conducted a BBC1 study which found out that the large front facing eyes and furry body of a Panda, appeal to our ‘cuteness receptors’ and hence they are so popular and liked by almost all of us. A panda’s diet consists of 99% bamboo shoots and leaves, which doesn’t contain much nutritional value. 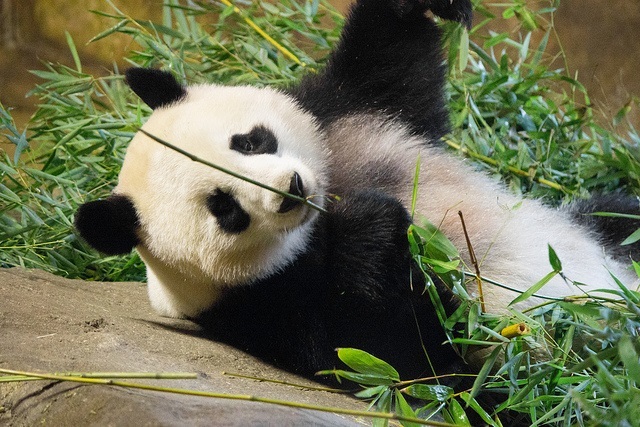 Its digestive system is carnivore adapted, making it unable to digest cellulose wall and hence pandas live on a low energy sedentary lifestyle, eating up to 30 pounds of bamboo a day, just to stay full. 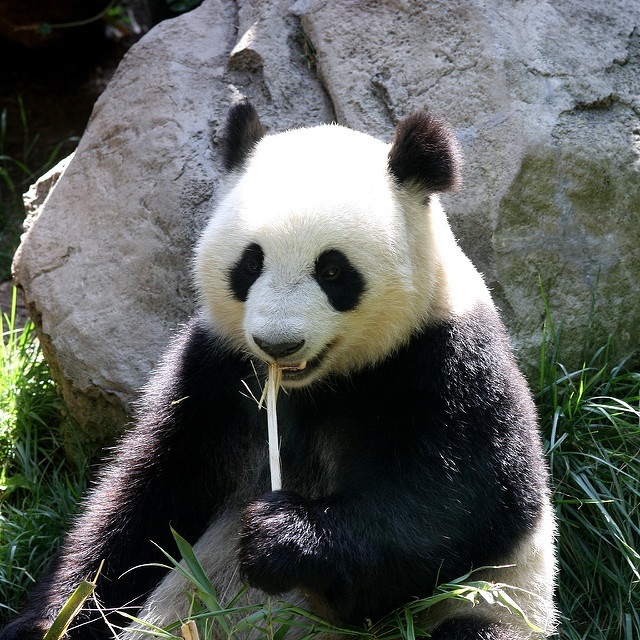 Giant pandas that live in captivity consume flowers, small animals, fish, milk, ground meat. Eggs and even specially made vitamin bread. 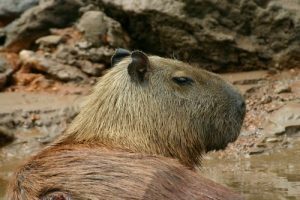 They also enjoy eating carrots and apples as a treat. Pandas can excrete as much as 28 kilos of poop each day. The undigested bamboo pieces in the excrement have been made into bookmarks and frames in the past and they apparently did not smell. Pandas do not make scary roaring sounds like most bears; instead they make friendly honking and bleating sounds to communicate with other pandas. They even have a hilariously famous sneeze. Giant Pandas mark their territories by leaving scent marks, which also serves as a form of communication. 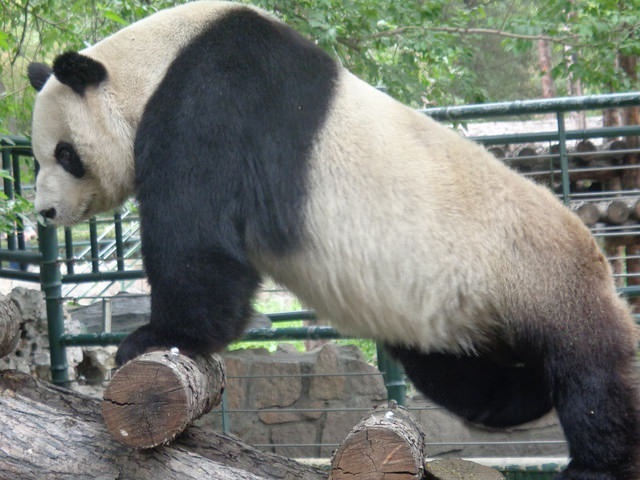 The gender of the Giant panda, how recently they mark was left and if the female panda is in her reproductive period, can be determined by the scent left behind by them. Pandas live on their own and demand a large portion of the forest for themselves as they do not have enough energy to fight with other pandas for territory, mates and food. One of the reasons for the dwindling population of Pandas is that they only ovulate once each year and during the ovulation period, they are only fertile for 2 or 3 days. Just like humans, Pandas have 2 sets of teeth during their lifetime (42 teeth). 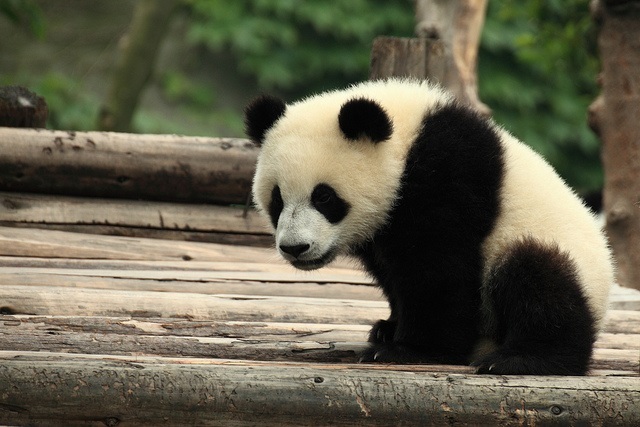 Pandas are blind for the first two months of their lives and only begin to crawl when they turn 3 months old. The throat and guts of a Panda is covered with a thick mucus layer which provides protection against the bamboo splinters they consume. When a Panda gives birth to twins, the mother chooses the strong newborn over the weaker one before it dies. A baby panda weighs about only 140 grams (1/900th the size of its mother) at birth and they gradually develop the white and black coloring. 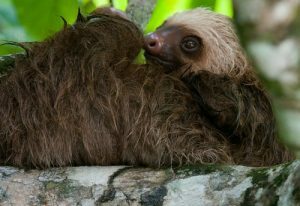 A giant panda is born the size of a stick of butter and is helpless and hairless. The mother provides great care to the tiny cub, usually by cradling them in one paw, holding it close to her chest. Even several days after the birth of a baby panda, the mother doesn’t leave the den to even drink or eat. Pandas don’t hibernate like other bears do because the bamboo they consume doesn’t give them enough energy to live through the winter. The jaw and cheek muscles of a Panda wield great strength which can easily chew an aluminum product into pieces. When a panda is a cub, the eye patch is circular in shape but as it grow older the eye patch changes to that of a teardrop. 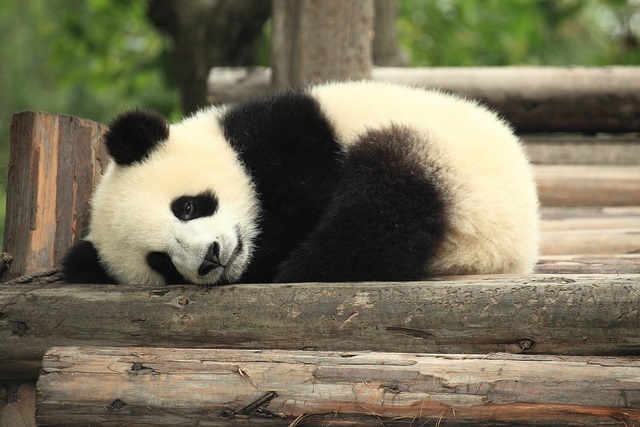 Pandas are one of the endangered species since 1990 and it is on the brink of being extinct. Scientists are trying hard to increase the population from the current 1000 to 8000 at least by 2025. The Yin-Yang Chinese philosophy states that the world is a combo of two opposite forces that comes together to bring peace. The white and black coloring and its peaceful nature is why the Panda is considered a symbol of this philosophy. In ancient times, the white flag with the image of a panda was raised while declaring peace during a war. WWF chose panda as their logo for a very surprising reason- to save cost! 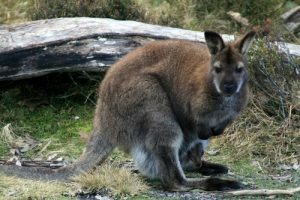 One of the founders; Sir Peter Scott stated that they were looking for an animal that is endangered yet beautiful and one that is loved by the people around the world and also had an impact in white and black to save the money on printing costs. A group of panda is called an embarrassment! Scientists have wondered for years if Pandas were a kind of a raccoon, bear or their own. By studying the genetic code or DNA in the panda’s cells, they have confirmed that relationship of bears with pandas. Only in 1869 did the West learn about the panda, when a French missionary was given a skin from a hunter. In the illegal trade market, panda fur is worth about 60,000- 100,000 dollars. The pandas held in captivity around the world, are all on loan from China. By agreement, when a panda cub is born , it will send back to China to help in expanding the gene pool. Researchers and scientists who wish to study Pandas, wear costumes to work with cubs. The fossils that have been discovered show that the giant panda has evolved somewhere between two and three million years ago. The panda’s scientific name Ailuropoda melanoleuca translates into black and white cat-foot. Pandas are incapable of running fast, and is seen mostly in a relaxed posture. Their behind legs are unable to stand because of the heaviness. In a zoo, keeping a single panda is very expensive and costs about 5 times more than the most expensive animal which is the elephant. A panda isn’t considered a full-fledged adult till they reach the age of 5. For male pandas, it can even take up to seven years to reach their adulthood. This means that the pandas may end up spending a quarter of their lives in childhood, running away from a leopard if their mother isn’t around.A panda looks like it has big bear mitts but actually has a real thumb on its paws which allow them to actually grab stalks of bamboo, pull the leaves off and then enjoy it. Even a young cub who can walk upright will sit while eating. A panda’s sense of sight may not be very good but their sense of smell is unbelievable. A Panda can smell the scent of bamboo from miles away and that is how they can find a new field of bamboo to graze on or return to their favorite bamboo spot. Researchers who have shown a video of pandas mating to pandas have observed that it helped them to figure out how to reproduce and in turn help in increasing the population. Panda’s fall asleep wherever they feel like it and do not have a specific sleeping spot. Pandas are known to sit alone when they are feeling sad. Pandas don’t use facial expressions to communicate with one another; instead if they want to threaten another Panda, they stare at their opponent with their heads down. It is believed that a panda does this so that their black ears will look like eyes against the white color of their fur. One of the world’s most famous panda is a character from an animated movie which came out in 2008; Kung Fu panda features a giant panda called as Po. The movie ended up breaking box office record in Korea and China. In the wild, after a male panda is done mating, they leave the female panda and play no part in the bringing up of the cub. 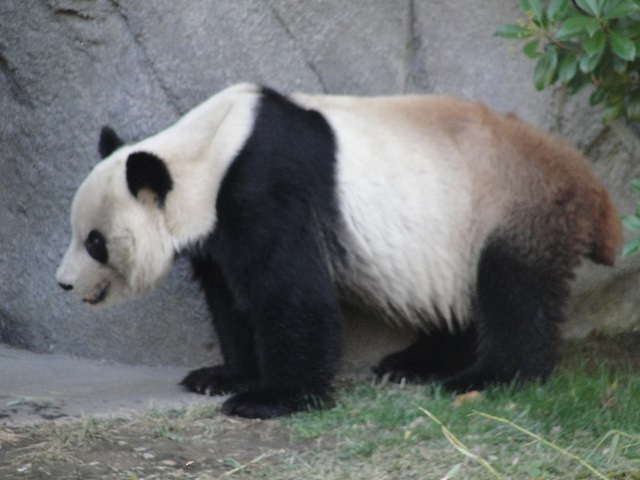 A phantom pregnancy is not uncommon in pandas. The definite evidence that a panda is expecting is available shockingly only 24 hours before the birth of a cub. In China, in the year 1985, cataract was successfully removed from the eyes of a giant panda. The image of a Panda is seen on some Chinese coins and the government own 3.8 million acres of reserved wildlife area to protect the Panda’s natural habitat.